For 2 weeks this July follow the athletes of Team Ottawa as they participate in the 19th Maccabiah Games in Israel. Athletes, parents and supporters will be posting stories, photos and results direct from the Games! 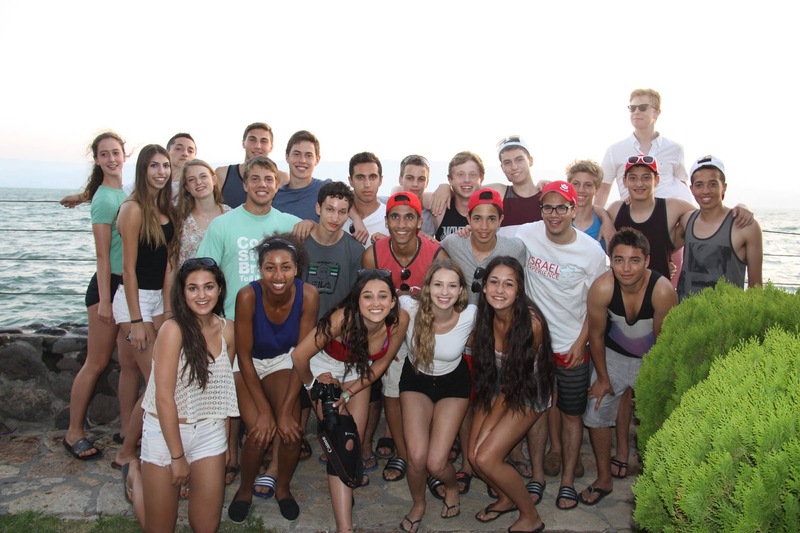 Another great day in Israel for Maccabi Canada's Junior Delegation. This time it was in the North, where we paddled down the Jordan River. Amazing views and pretty calm water were in abundance for most of the day, although near the end of the ride we found a giant rapid to go down. Our next stop was dinner and a cruise. The setting for dinner was a beautiful seafood restaurant, which was followed by a sunset cruise into the mountains, while listening to some great music. Tomorrow is the last day of our Junior Delegation's Israel Experience, with our boys and girls planting trees and visiting Latrun. Competition for some members begin as early as Thursday morning. Wednesday is also the day we welcome the rest of Maccabi Canada's delegation. Our full team of more than 600 athletes and coaches will be in Israel, and with that comes the realization that we are only 1 day away from the Opening Ceremonies. A viewing guide for fans in Israel and around the globe who want to watch the 11-day sports competition. The 19th Maccabiah Games opens on Thursday with a parade of athletes from around the world entering Jerusalem’s Teddy Stadium, followed by 11 days of exciting competition. Below is a viewing guide for fans in Israel and around the globe who wish to follow the action. Jewish Life TV (JLTV) is the exclusive broadcaster of the Games outside of Israel. JLTV will air the opening and closing ceremonies on July 18 and 30, respectively,live and rebroadcast them during primetime in the United States (8-11 P.M. Eastern and Pacific times). Click here to see if your cable/satellite provider carries JLTV; it can also be streamed 24 hours a day for free here. The network will air one hour of Maccabiah programming each night of the competition from 9:00P.M-10:00 P.M. Eastern and Pacific times. The programs, which will be rebroadcast the following day at various times, will spotlight athletes from Australia, Canada, Columbia, Cuba, Denmark, Great Britain, Gibraltar, Guinea Bissau, India, Israel, South Africa and the United States. Results from the day’s events will appear in an on-screen ticker. Decisions about which events to carry live will be made as the Games progress. Check the JLTV website for updates. Channel 1 will broadcast the opening and closing ceremonies live. Coverage of the opening ceremony will begin at 8:30 P.M., while coverage of the closing ceremony will begin at 9:00 P.M. Video highlights from the Games will air at 9:15 P.M or 9:30 P.M. each night (check your listings) and will be available on demand on the Israel Broadcasting Authoritywebsite. Viewers in Israel can also stream JLTV’s coverage of the Games, as detailed above. Junior women's volleyball is getting excited! 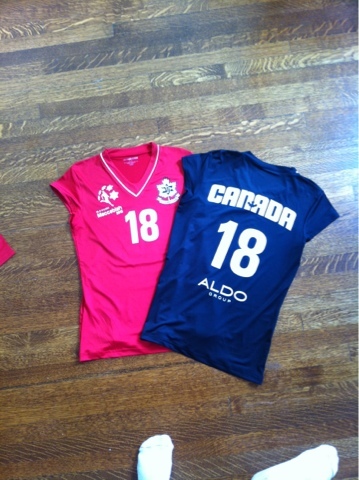 After coming into Toronto on Sunday night to be with the junior women's volleyball team for our training camp we finally got our jerseys today at our morning practice !! Such a small thing but its making me and all of my team mates so excited ! We plan on wearing the red and black and white with pride and bringing home the gold ! Shout out to our coach Elie Shermer for choosing a great jersey and a great design... I hope Israel is ready to experience Canada's volleyball.. Because Canadian volleyball is ready to experience Israel !!! The Maccabiah Games is the third largest sporting event in the world. Nearly 10,000 athletes will compete in the 2013 Maccabiah from over 70 dif­ferent countries. The principal mission of the Mac­cabiah is to facilitate a worldwide gathering of Jewish athletes in Israel, staging the highest possible levels of sports competitions, and strengthening their connection to the State of Israel and the Jewish people everywhere. The Maccabiah Games help teach and promote Jewish unity, history, culture and continuity. JLTV is the exclusive Television provider of the Maccabiah Games in the US, Canada, and all other countries outside of Israel. JLTV understands the importance and impact of the Maccabiah Games and is committed to broadcasting the Games to as many viewers as possible. In 2013, JLTV will bring live coverage of the Maccabiah Games to over 45 million US households and an additional 70 million households internationally. JLTV is supporting and taping a number of first-time participant countries including: Albania, Armenia, Bosnia, Croatia, Cuba, Czech Republic, Kyrgyzstan, Macedonia, Montenegro, Serbia and Slovenia. Other countries that have participated in the games only once or twice and will be spotlighted on JLTV's daily broadcast: Bolivia, Ecuador, Kazakhstan, India, Paraguay and Romania. For 2 weeks this July follow the athletes of Team Ottawa as they participate in the 19th Maccabiah Games in Israel. Athletes, parents and supporters will be posting personal stories, photos and results direct from the 19th Maccabiah Games in Israel this summer. While in Israel the data and roaming charges will most likely be quite expensive when using a smartphone from Canada. A cell phone with unlimited calls in Israel and North America for $4.99/day and $6.99 with Data. Full pricing and information is available in a downloadable PDF document. Contact Larry Lavitt if you need access to contribute to this blog. © 2013 Maccabi Canada and respective Team Ottawa athletes. Theme images by Jason Morrow. Powered by Blogger.